When he drives a hitch, he’s still got the itch. And that’s why Brian Coleman’s third career win on Sunday afternoon at the Calgary Stampede’s World Champion Six Horse Hitch Competition doesn’t feel old hat at all. Brian Coleman of Didsbury, Alta., drives the Jackson Fork Ranch outfit of Bondurant, Wyo., to victory Sunday during the Calgary Stampede’s World Champion Six Horse Hitch Competition at the Pengrowth Saddledome. Calgary Stampede photo. Coleman also drove the Strawberry Lane Percherons rig of Oconomowoc, Wisc., to victory at the Stampede in 2002 and 2004. Relative newcomers to the scene, the Jackson Fork Ranch crew snared their first World Six championship – and $10,000 winner’s cheque – against one of the toughest fields in event history on Sunday. 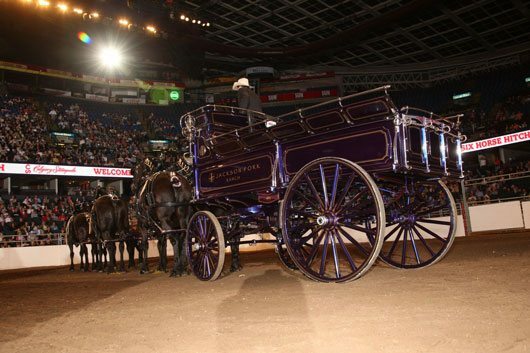 Not only did the World Champion Six Horse Hitch Competition field 15 rigs, matching the most ever, but for the first time in most committee organizers’ memory, five wagons were called back to the Saddledome infield for a drive-off. The Jackson Fork Ranch outfit of Bondurant, Wyo., a newcomer to the Calgary Stampede, won the World Champion Six Horse Hitch Competition on Sunday at the Pengrowth Saddledome, topping 14 other rigs from across North America. Calgary Stampede photo. When the smoke cleared, Coleman’s Jackson Fork Ranch rig was declared the winner, while the Prins View Belgians of Fort Saskatchewan, Alta., driven by Zephrin LaRiviere, were runners-up. Also in that drive-off were the Mark Messenger Memorial Hitch of Cheyenne, Wyo., the McLaughlin Clydes of Listowel, Ont., and the Rocky Bar Belgians of Esterhazy, Sask. 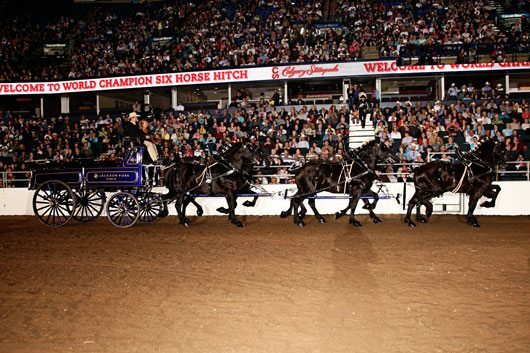 The Jackson Fork team of jet-black Percherons is also the first mare hitch to win the World Six, the highlight of the Stampede’s annual Heavy Horse Show. A panel of three judges rated Sunday’s 15 entries for conformation, presentation, driving and reinsmanship. For the 11th straight year, Sunday’s Six Horse Hitch competition was accompanied by live music, courtesy of a full 38-member orchestra of musicians from the CPO, led by its new resident conductor, Melanie Leonard. Musical highlights included Rossini’s William Tell Overture, Strauss’s Radetzky March, Offenbach’s Can Can, Dvorak’s Slavonic Dances, and Bizet’s Les Toreadors. 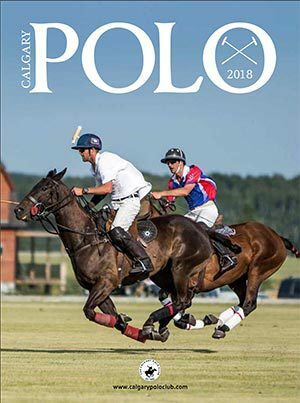 The Jackson Fork Ranch folks only began showing hitches last year across the American midwest, and Sunday’s World Six was only the second show at which they’ve fielded a six – last weekend in Olds, Alta., being the first. “We scoped a lot of top sales in the States, and knew individual breeders who had great animals available,” said Coleman. “I’ve got training programs set up for them . . . we have days where we work slow and heavy, and days where we’ll do cardio – lighter weights and longer distances. The seeds of the Jackson Fork Ranch championship, in fact, were sown a year ago at the 2009 Stampede. The Stampede’s Heavy Horse Show sees Belgians, Clydesdales, Percherons and Shires competing in more than 100 classes over four days. 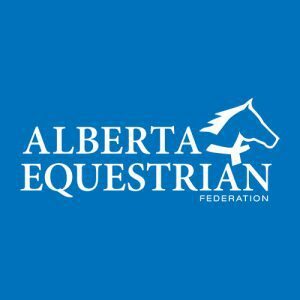 The affair wraps up on Monday, July 12, with breed Supreme Champions and the overall best in show crowned at 11 a.m. in the Saddledome. Classes include cart-drawn single horses, two-horse teams, three-horse unicorn hitches, and four- and six-horse hitches. 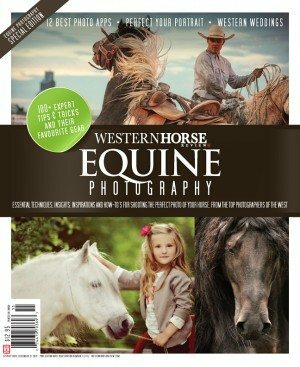 This year, entries have arrived from as far away as Eastern Canada, the American East Coast, the U.S. heartland, and the U.S. Pacific northwest, giving the Stampede’s Heavy Horse Show a true coast-to-coast flavour. Heavy horses have been part of Calgary’s annual agricultural fair for 125 years, dating back to the Stampede’s predecessor, the Calgary Industrial Exhibition. 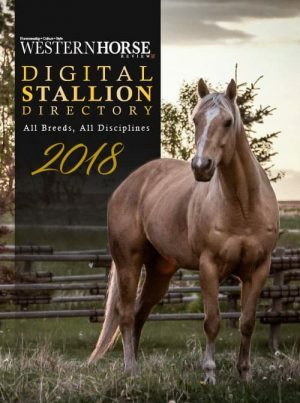 They’re the longest-running agricultural component of the Stampede and its predecessors, and the only livestock class consistently presented throughout that period.